This kettle corn is the real deal. I love the sweet and salty mixed together in this super delicious treat. No more waiting for fair time to buy an expensive bag. Have some fun making it at home! 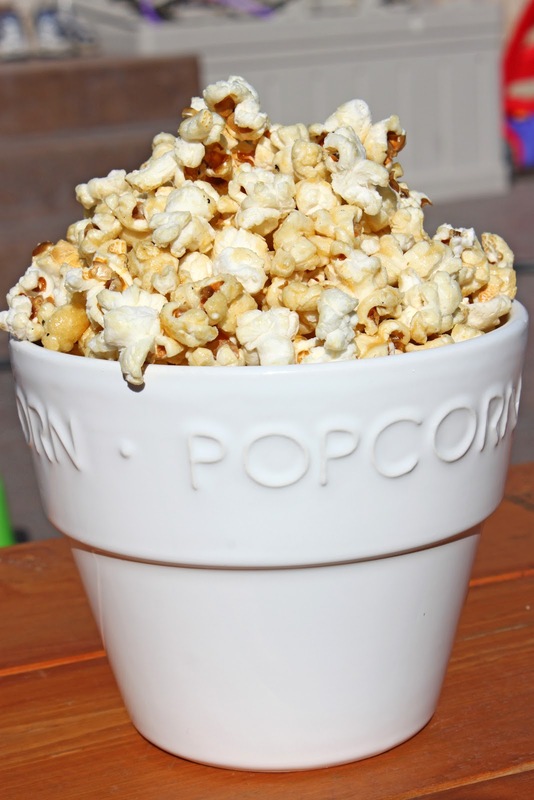 Pour oil and popcorn into a large pot and turn onto medium heat. Stir with large spoon or cover pot with a lid and shake once in awhile. As soon as the corn begins to pop, (4-5 kernels pop) remove lid and add sugar. Stir constantly while kernels continue to pop so they wont burn and the sugar will distribute evenly. Keep pot covered as much as possible while stirring or shaking so the oil and popcorn don't attack you. Once the popping has slowed to once every 2 to 3 seconds, remove the pot from the heat and continue to shake for a few minutes or stir until the popping has stopped. Pour into a large bowl and sprinkle with salt. Allow to cool, shaking occasionally to break up large clumps. 1. Turning the heat up won't cook the popcorn faster, it will just burn your popcorn. Keep the heat on medium and be patient. 2. Use a good bag of popcorn. Old popcorn doesn't pop very well and when you have un-popped popcorn mixed with the good stuff, it all just sticks together. As the kettle corn dries, it will separate, but the kernels will not fall to the bottom of the bowl simply by shaking. 3. Do one batch at a time. When outdoors, we use a large, tall turkey pot so we thought, why not double the batch? If there are too many kernels in the pot, they won't pop evenly and the time-frame is too long and it will burn. 4. Keep the kids away. Ours are always trying to sneak a peak but you never know when a kernel or splat of oil will come flying out! 5. We prefer stirring to shaking. In the times we have made this recipe, as the popcorn begins to pop, if your not careful, everything could start to stick to the bottom of the pan. If using the shake method with the lid on, your not entirely sure whether or not anything is sticking. By stirring you can keep the popcorn, oil and sugar moving around more evenly. Good luck! This recipe is awesome, but I would love feedback or to hear how your experience goes! 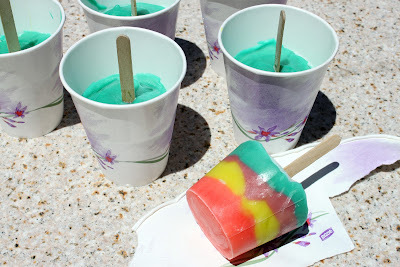 The kids and I have fun making these super easy summer treats. They love picking the colors, helping stir the pudding and deciding which way it should be layered. It's a great way to get the kids involved and let them make the decisions. Follow the directions on the packages of pudding. Once the pudding is mixed according to the directions and has thickened up, evenly separate it into 4 to 6 smaller bowls. Add different colors of food coloring to your divided up pudding. Then stir until the pudding is the color that you want. Spoon the different colors of pudding into your cups. 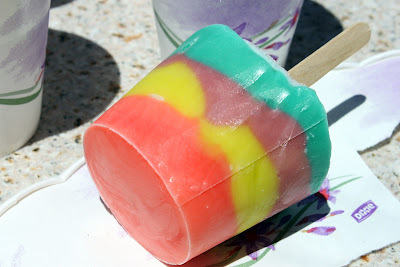 Try to do smooth and even layers so that you will see a good rainbow on the sides of the pudding pop. Put a popsicle stick into each of the cups of pudding. The pudding should be thick enough to hold up the stick…if not, cover the cup with plastic wrap and then put the stick through the plastic wrap and into the pudding. Place the pudding pops in the freezer for a few hours. The time will depend on the size of your cups. After they are completely set, take the pudding pops out of the freezer. Use your hands to warm up the sides of the cup so that the pudding pop will come out of the cup easily. (The Dixie cups are what I use and you can just tear the wax cup off). 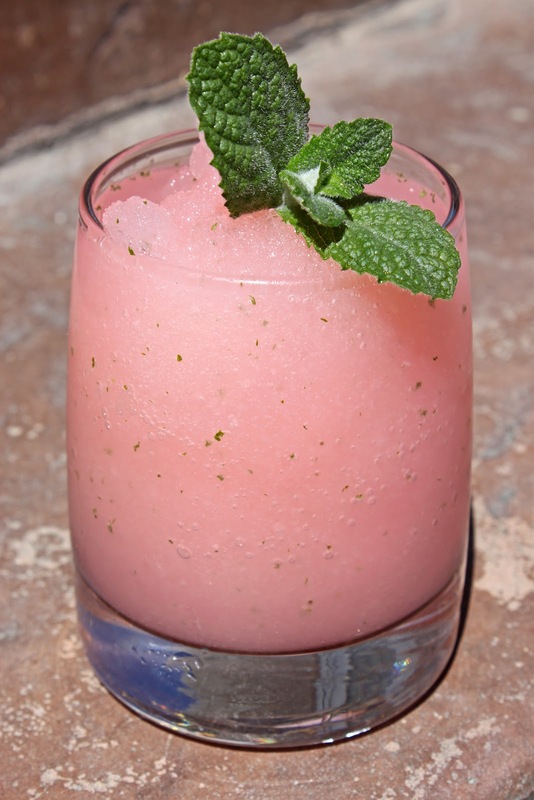 This drink is super easy to make and fun to serve at weddings, baby showers, or parties. The slush is stored in the freezer so you can even pull it out to share with friends and then put the rest back in the freezer for another time. Dissolve sugar in 3 cups of boiling water. Add package of raspberry Jello and stir until dissolved. Pour in 7 cups cold water and the can of pineapple juice and stir until well combined. Put in a container and freeze until ready to serve. * I filled 19 cups into a container. When serving, let the container of slush thaw slightly on the table until you are able to dig a spoon into it. 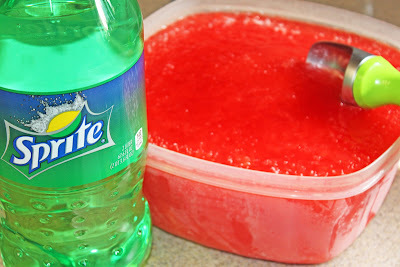 Scoop slush into cups and pour Sprite over the top. We enjoy this refreshing drink all summer long. Mint leaves are a great addition to this delicious lemonade beverage. Also try with regular Country Time Lemonade. Fill blender with ice cubes until blender is about ¾ full. Pour in water until it reaches the top of the ice. Add desired amount of lemonade powder. Blend until slushy. Add 2-3 mint leaves and blend well. 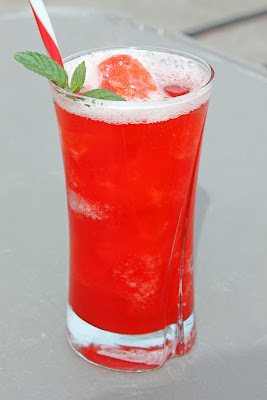 Add more lemonade powder to make it sweeter if desired or more water and ice if it is too sweet. You can also add additional mint according to your taste.